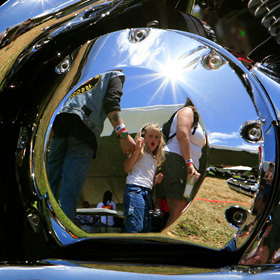 PARADISE BIKEFEST » Eleven-year-old Haleigh Grimes reacted yesterday as she was reflected off the chrome of a show bike during yesterday's Paradise Bikefest at Kapiolani Community College. Ala Moana Center's annual fireworks show will start at 8:30 p.m. tomorrow. Developers want to build 180 cabins on a parcel surrounded by conservation land. Community leaders say a new inland route would help traffic and the famous, fragile coast. A golf clubhouse borrows plans that Frank Lloyd Wright drew for Marilyn Monroe. She continues to play steady, but does not come up with the big shots to turn the tide. The new labor relations director for the company used to represent the union's flight attendants. A change in the Voting Rights Act could put Hawaii under federal supervision. A neighborhood board has voted against a new store proposed for Kapolei.